Chevrolet issued equipment and pricing updates periodically throughout the model year. The info on this page (except the color chart) was taken from an update dated December 15, 1963 (and is unchanged from updates dated August 19 and November 1). Use this information to assemble your "dream FC" or just to drool at the reasonable prices (by today's standards)! * Base discount is 21% with the 2% difference retained for dealer's account in accordance with Dealer Price List. ** Manufacturer's's Suggested Retail Price does not include state and local taxes, license fees, options or accessories. The prices in italics were not typeset but were instead hand-written in blue ink in blanks provided. This is due to the destination charge (and therefore the total) differing depending on dealership location. In the next two tables below, the numbers in the "Ordering Col-Code" column matched each option with the correct box on the dealer's order form. 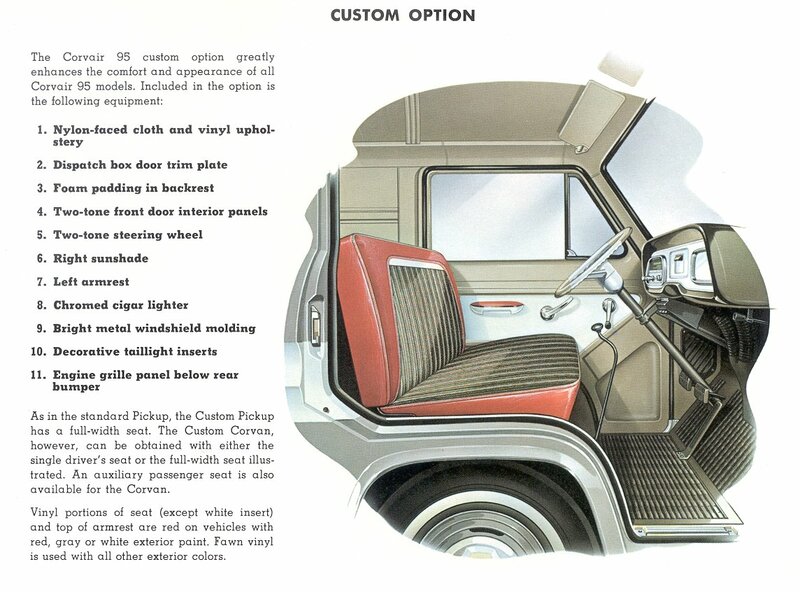 Check out this sample order form from the 1964 Truck Data Book. * State and local taxes not included. Note: Some versions of the tire table (above) and options table (below) have the Dealer Net column deleted. I'm not sure why this is the casemaybe to obscure the dealer's cost from customers who were granted access to the tables? Shock Absorbers: (Except Model R1206) Heavy-duty; front; piston dia 1 3/8"
On 11/6/63, RPO A20 (standard front seat belts), RPO A49 (deluxe front seat belts with retractors), & RPO A62 (front seat belt deletion) were added. On 4/1/64, RPO L62 (110 HP engine) was illustrated. Also on 4/1/64, RPO A20 (standard front seat belts) was made standard equipment; RPO A37 (deluxe front seat belts) was cancelled. 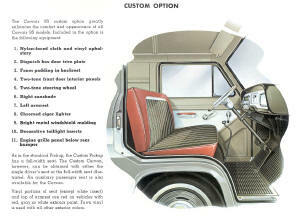 Also see more information on '64 FC seat belts, speedometers, and steering wheels. The following information was printed on the same pages as the standard equipment and option information above but is dated November 1, 1963. I also checked a chart dated August 19, 1963. The three combinations in red below were not listed in the August chart. Two-tone combinations: Off-white is used as secondary color except when the main color is off-white or white then red is used as second color. 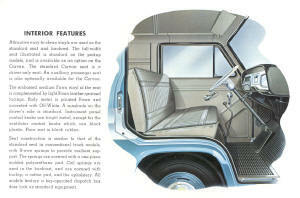 The information in the following two paragraphs is taken from page 2 of the Colors section of the 1964 Chevrolet Truck Data Book. 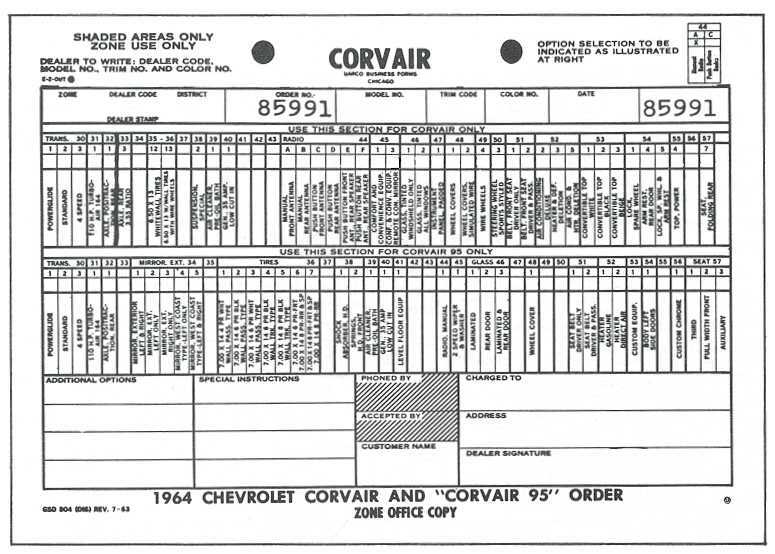 Both paragraphs are specific to Corvair 95—they were marked "Series R10 only". Trim colors: White vehicles have White bumpers and hub caps. With all other exterior colors, the bumpers and hub caps are painted Off-White [aka Ivory]. Front ventilation grille and light assemblies are bright metal. Wheel colors: With all solid colors, wheels are painted black. With the Off-White [aka Ivory]/Red and White/Red two-tone combinations, wheels are painted Red. With all other combinations, wheels are painted the main body color. The names of the colors in the table above are not very descriptive. 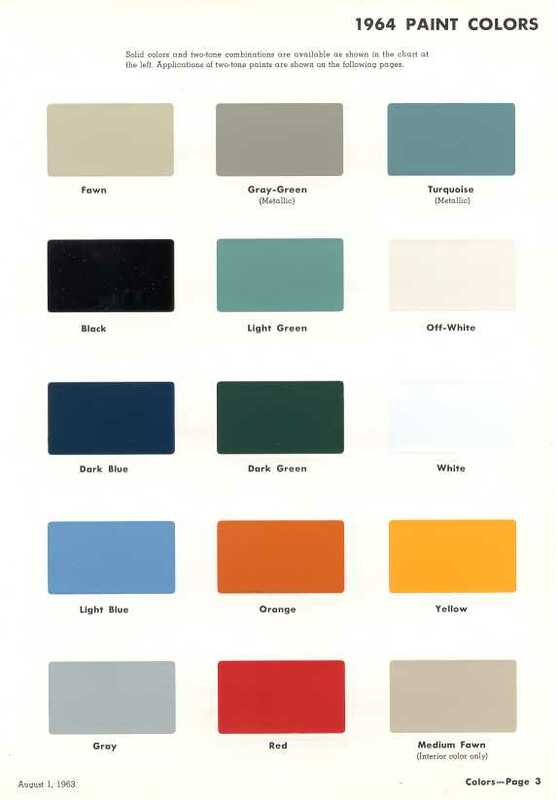 Fortunately, I have the color chip chart for 1964 Chevy trucks and have scanned it in for your reference. The colors in this scanned and compressed image are only approximate! The information in the table below is taken from the September, 1963 Chevrolet Service News. The DuPont and Rinshed-Mason paints are acrylic lacquer; the Ditzler is enamel. (A) Where low gloss is required add flattening compound in acordance with label directions. (B) Used only on Corvair "95" series trucks. The information below was taken from the 1964 Chevrolet Truck Data Book (dated August 1, 1963) and therefore applies to all models except the Greenbrier. Click on an image to see the full-sized version. The first image is for the standard trim level; the second is for the custom or "deluxe" trim level. There are some subtle differences between the standard and deluxe interiors so be sure to look closely! Unfortunately, I have not been able to confirm the paint code for the dull silver color used on the instrument cluster & glove box door. (I checked with Dave Newell and even he didn't have the code!) The other interior paint codes are listed in the table above (Fawn and Ivory).